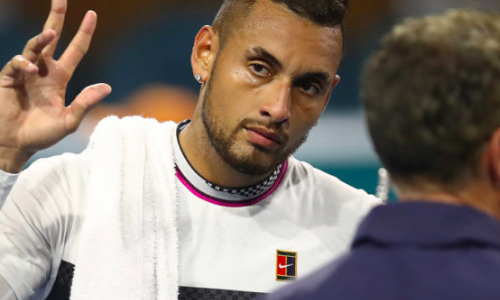 Nick Kyrgios was at his controversial best during his 6-3 6-1 win over Serbia’s Dusan Lajovic in the third round of the Miami Open on Sunday. He would later reveal the fan labelled him a ‘d***’ during the 57-minute encounter. That wasn’t the only talking point of the match though. Kyrgios accentuated his showman tag by serving underarm on a couple of occasions. And guess what? One of it turned out to be an ace (see video below). Besides, Kyrgios also entertained the crowd with an incredible no-look shot. No wonder, all of it combined was too hot to handle for Lajovic. Kyrgios, the 27th seed, is scheduled to lock horns with 11th seed Borna Coric of Croatia for a place in the quarter-finals.